I’ve been sketching people quite a bit lately and mostly while they’re moving about, which is a challenge, to put it mildly – but it’s what I want to draw more than anything else at the moment. I find it irresistible and at the same time frustratingly hard. 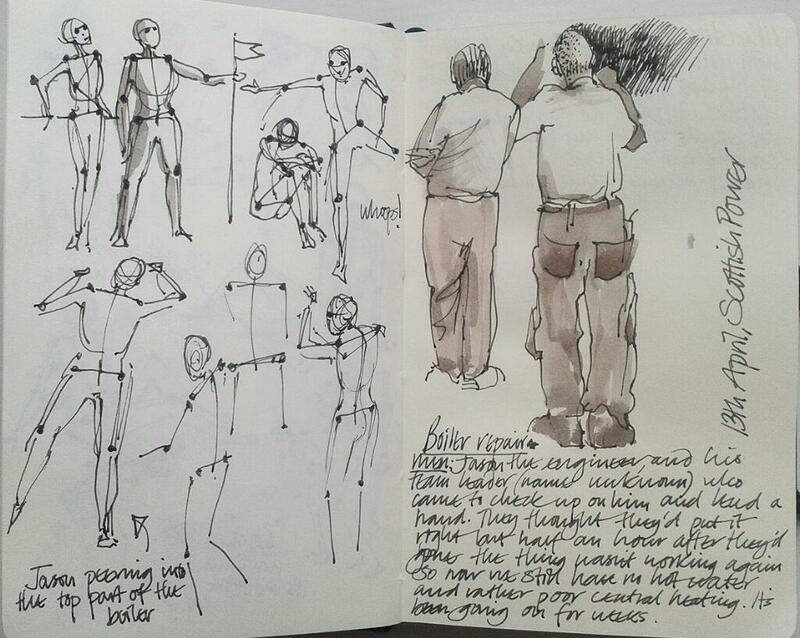 I realise that I’ve forgotten much of what I knew about figure drawing and it’s such a long time since I attended a life drawing class – which I’d love to do again – but in the meantime I want to understand more about how bodies move – what really happens for example, when we walk? There’s nothing like direct observation – watching and drawing as much as possible is the best way to improve – but I don’t have enough opportunity. 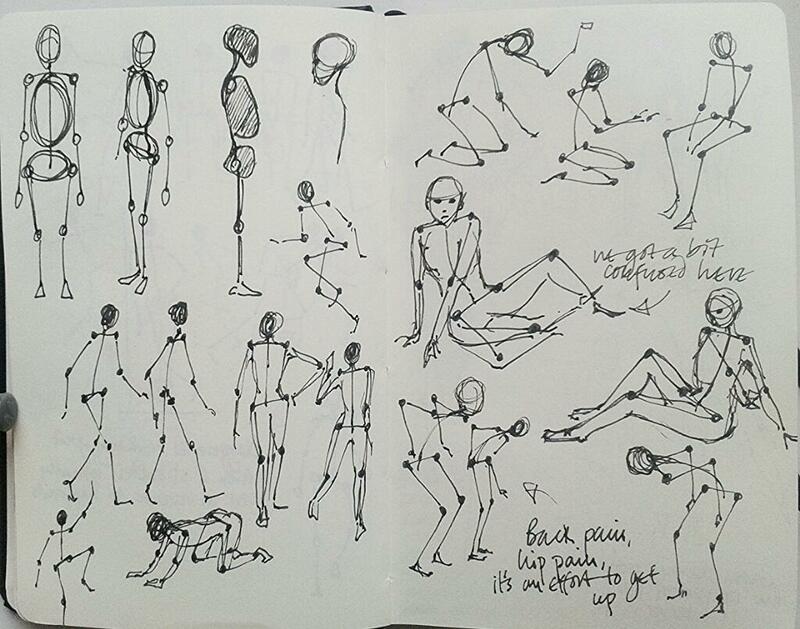 I trawled the internet, and after a few red-herrings and blind alleys I came across this tutorial from Elfwood, called Figure Drawing: Basic Pose and Construction. It’s really designed to help animators and graphic artists but it’s a good step-by-step workout to help you understand how the body is constructed and connected, and how it moves, and it’s all about using stick-figures, or what we used to call pin-men. This is where it all became a lot of fun. 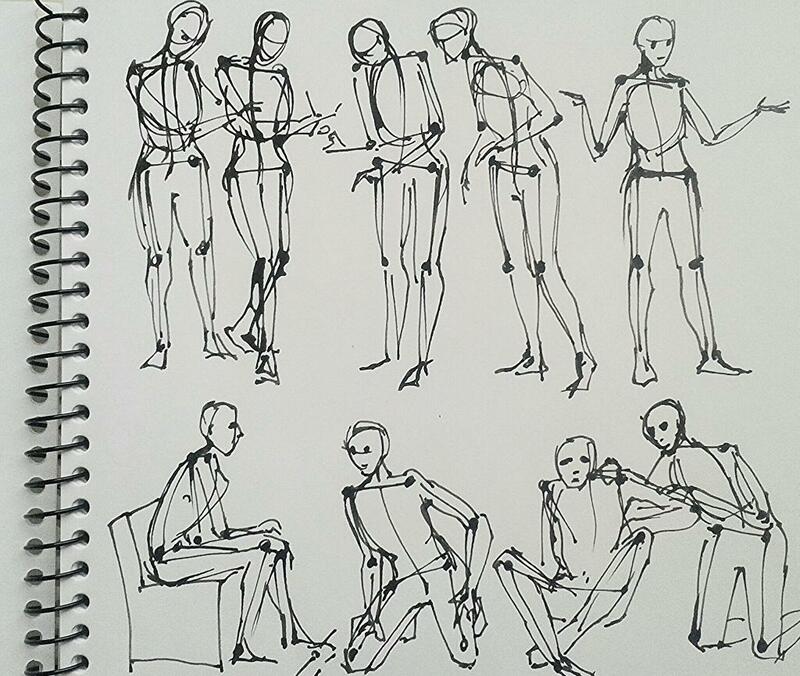 I hadn’t drawn stick-figures for years, and I’d forgotten how expressive they can be. But this lesson takes you further than just those rather stiff little pin-men everyone loves to draw, and introduces an advanced species of figures that have shoulders and pelvises, who have all the major human joints and a bit of spring and curve in the spine. Before long they’re capering about across the page and doing things you recognise but would have struggled to draw. I was hooked. The next step is to flesh them out and give them a bit of substance, and here I’ve departed a bit from the tutorial which sticks to a more geometrical approach with simple cylinders for the trunk and limbs, but I was in a hurry to get my little tribe looking a bit more lifelike. They took on a life of their own remarkably quickly. 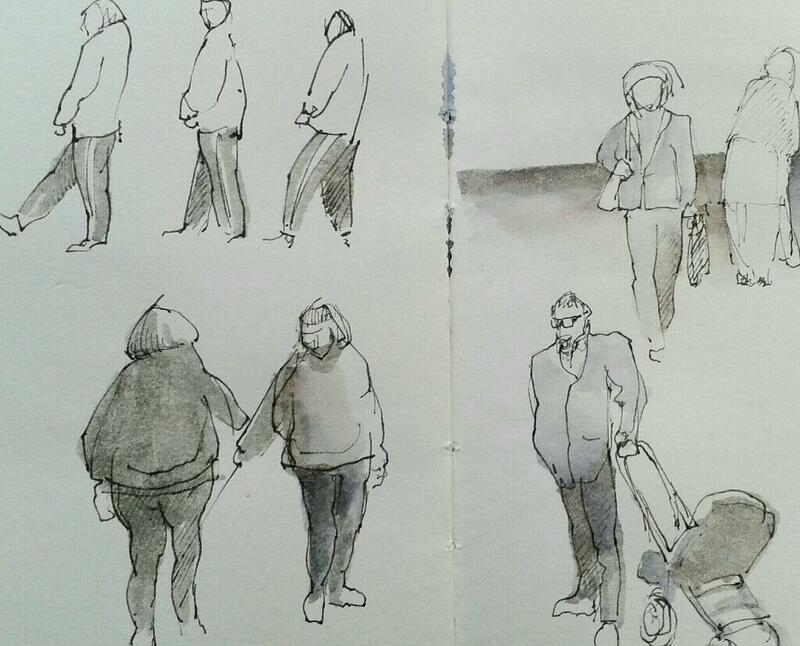 The question of whether all this helps when drawing real people from life was answered for me when the boiler repair men came and I drew them surreptitiously from behind while they were working. One of them was stretching and peering and grappling with the boiler while the other watched, and I realised I could sum up each movement rapidly in my head as if I was looking at a stick-figure with clothes on. This is them, on the left and right of the page (though not at the top left – they didn’t arrive holding a flag on a pole or hopping on one leg -) and although baggy combat trousers don’t help show off what the legs underneath are doing, stick-figures really helped me see what his whole body was doing as it moved – even if I didn’t have any idea about what he was doing to the boiler.